Over the last 24 hours, Russian-terrorist troops in the conflict zone in Donbas continued actively shelling the positions of Ukrainian troops, using small arms (practically along the entire demarcation line) as well as 122 mm and 152 mm artillery, armored vehicles, 82 mm and 120 mm mortars; the use of MLRS was also recorded. In particular, in the Donetsk sector, terrorists made multiple strikes from 120 mm and 82 mm mortars on the advanced ATO forces’ positions in the area of Opytne – Vodyane, south and northeast of Avdiivka, and in the vicinity of Pisky. Near the settlement of Mar’inka, militants employed 152 mm artillery and 120 mm mortars; over the past 24 hours, terrorists in this area also actively used AGS-17 automatic grenade launchers and 82 mm mortars, which were used for brief fire strikes and then moved along the front line. In the area of Lozove, Krasnohorivka, Pisky, Starohnativka, Prokhorivka, and Orlivske, the enemy used 152 mm artillery on multiple occasions. Eight 152 mm shells were detonated in the residential sector of Krasnohorivka. On the Troitske – Novhorodske – Shumy stretch, the enemy opened fire on the positions of Ukrainian troops using 120 mm mortars. Terrorists stationed in the areas between Druzhba and Zaitseve, and Zaitseve – Dacha, carried out sporadic mortar and artillery fire in the direction of Kurdyumivka. In these areas, militants use mortars of the two main calibers – 82 mm and 120 mm. A militant self-propelled artillery unit (10-12 units of “Gvozdika” 2S1 self-propelled 12 mm artillery) was observed maneuvering along the front north of Horlivka. In the vicinity of Popasna, Katerynivka, and Zaitseve, the enemy is active in the first line, employing AGS-17 grenade launchers and 120 mm mortars (3 fire groups with mortars operating from the “greenery”). Militant sabotage and reconnaissance groups were also recorded in this area. Near Novotoshkivka, Krymske, and Shchastya, the enemy carried out continuous shelling from mortars, mobile ZU-23-2 artillery units, and AGS-17 grenade launchers. Militants also used Grad-P 9P132 reactive artillery systems. 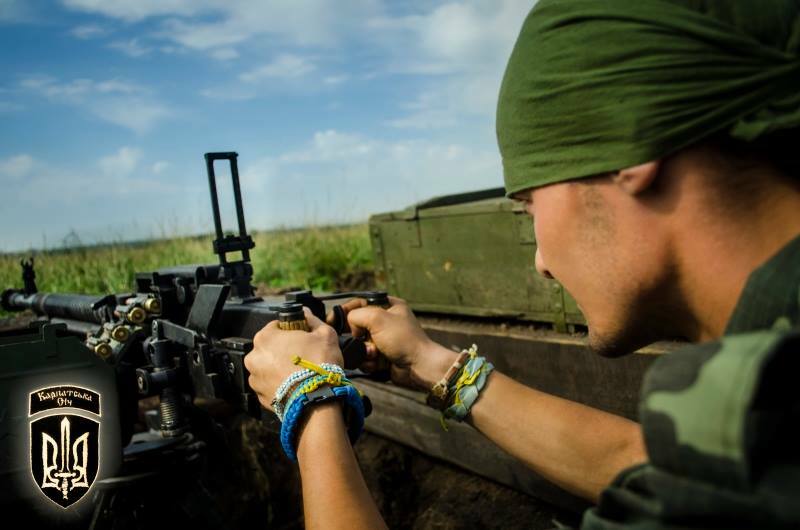 Similar terrorist activity was observed in the vicinity of Stanytsia Luhanska, where a new reinforced insurgent battalion has been transferred to the front. In the coastal areas, the enemy is particularly active, employing the whole range of heavy weaponry to shell the ATO forces’ positions: 122 mm and 152 mm artillery, armored vehicles, 120 mm mortars, and MLRS. Enemy artillery positions (a total of 8 batteries) are located in the vicinity of Oktyabr, Kominternove, and Sakhanka. As the IR group reported earlier, these artillery units are combined into three artillery groups operating in this direction. – in the vicinity of Sakhanka and Bezymenna, an incomplete militant tank battalion is operating, using one company at a time. From time to time, 3-4 tanks advance to the front line, as far as the neutral zone, and deliver precision fire on the positions of Ukrainian troops. Southeast of Krasnohorivka, four terrorist tanks were spotted in the first line, spread out and camouflaged in the civilian residential areas. Rotation of militant infantry units was observed on the Lozove – Krasnohorivka – Mar’inka stretch. Rotation is carried out by using militant units (mainly Russian mercenaries, with notably low levels of training) transferred to the Petrovskyi district of Donetsk. The enemy transferred an additional infantry unit on board of BMP-2 infantry fighting vehicles and BTR-80 armored personnel carriers to the area of Telmanove. The “LNR” [Luhansk People’s Republic] instituted emergency fuel-saving measures in militant units. Any movement of equipment not related to “combat missions” (on personal errands) is strictly forbidden, under threat of harsh punishment. In the rear areas, the “commandant’s office” is in charge of controlling vehicle movement, while at the front, the gang commanders are responsible for that.